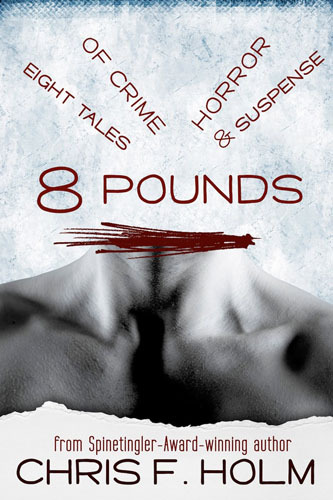 In 8 Pounds, author Chris F. Holm presents us with eight tales of crime, horror and suspense. The stories themselves provide glimpses into selfishness, self-preservation, betrayal and straight up horror. “On the first day, nobody paid it no mind. Sure, the power flickered and the gutters overflowed, but most just figured it’d blow over by daybreak. On the second day, the river swelled. Folks took off work to haul sandbags to the riverbanks, hoping to keep the rising waters at bay. They worked for hours in the wind and wet, and in the end, that river breached its banks and sent ‘em running. Look, if that doesn't grab you right away, I don’t know what will. The collection starts off strong with Seven Days of Rain, a story about guilt and doing what’s right despite your own best interests. While I wasn't a huge fan of the follow-up, A Better Life, Holmes hits us with a thriller in the third story about a woman on the run and an unsuspecting good Samaritan caught up in her circumstances with A Simple Act of Kindness. 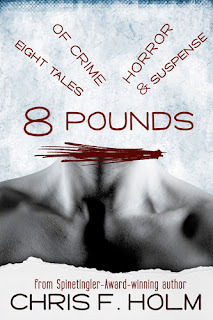 The book moves along smoothly with the pulse pounding Eight Pounds. Holm turns the suspense up to eleven as two best friends share drinks at a pub – one harboring a secret from the other. The tension rises when the guilty party suspects he’s been outed leading to a memorable conclusion. Aside from the very short The Well, the collection finishes up with a classic crime caper in The Big Score and a coming of age story in The World Behind. While I felt The Well seemed out of place and had a bit of a puzzling ending, the two stories that followed finished strong. The Big Score kept me guessing right until the very end while The World Behind tugged on the ol’ heartstrings. 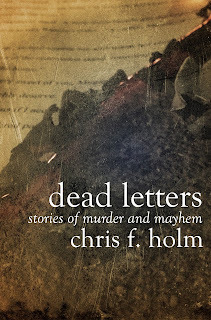 Overall, while I felt it was not as strong as its stellar successor, Dead Letters, 8 Pounds is a good collection of varied stories from a great author. Given its bargain price on Amazon right now – you should give it a read. I think I’m finally starting to come around on short story collections. While I’ve read a few that I couldn’t quite get behind, the ones that I’m enjoying are seemingly outnumbering the ones I don’t. 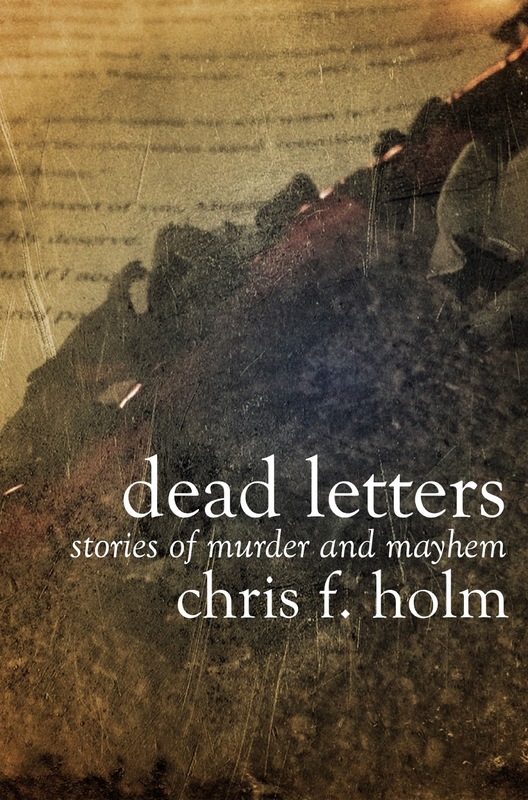 I was a big fan of John Connolly’s Nocturnes as well as Stephen King’s Full Dark, No Stars and now you can add Chris F. Holm’s Dead Letters to that exclusive club. There’s a lot to like about this collection. While most of them were enjoyable, a select few completely blew me away. My favorite of the bunch involved a couple moving into a home believed to previously have been inhabited by a famous writer from Maine. Without giving anything away, Holm crafted an ending that gave me chills the likes of which I cannot recall. In addition to that, there’s a fantastic story involving a murder mystery featuring the characters from Rankin Bass’ Rudolph The Rednose Reindeer. Holm had me laughing out loud injecting these G-Rated personalities into a noir-style setting. A few other great ones include “Action”, a hilarious bank robbery involving pretentious artists that goes awry, “A Native Problem”, a downright chilling tale involving cannibalism (or zombies) and “The Man With The Alligator Shoes”, a story that seems to mirror the frustration following the 2008 market crash. Oh, and it would be a crime not to mention the story that kicks things off. ”The Putdown” was certainly interesting enough given the style in which Chris chose to narrate the story. For someone not from the south, writing in a southern twang had to have been challenging. However, it was the ending that gripped me. I knew after finishing that solid opener, I had some interesting stuff ahead of me. At the risk of sounding like a fanboy, I can’t get enough of Mr. Holm’s work. Between his Collector series and now this short story collection, he’s an author that everyone should be looking out for in the coming years. Now, time to get 8 Pounds.